For computation of motion estimation in tagged-MRI, the interactive and augmented modelling group has developed the Harmonic Phase Flow (HPF) plugin. HPF is a variational approach that works in the Gabor domain, ensuring optical flow invariance as well as motion tracking robustness. Additionally, HPF computes wall deformation without overestimating motion at injured areas. commercial software capable of dealing efficiently with the great amount of data provided by the tagging studies is scarce. 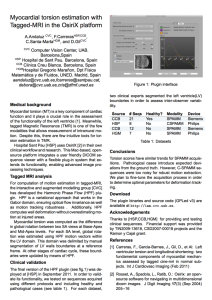 The Sant Pau hospital uses OsiriX as the preferred tool for TMR sequence viewing. Because of this, it is interested in the development of a plug-in for the extraction and validation of myocardial torsion from their TMR sequences. We have previously built a prototype in Matlab for this purpose. 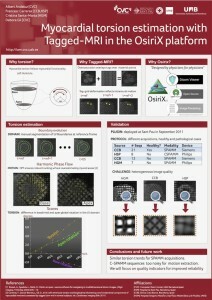 However, communication between Matlab and OsiriX is slow and memory intensive. Therefore we have decided to port existing code into Objective C.
A dynamic, object-oriented language, based on a set of extensions of ANSI C. It is the language of choice for Cocoa development. The graphics API choice for both 2d and 3d rendering. At large sequence lengths, it is beneficial for fast visualisation operations. The Visualization Toolkit (VTK) manipulates data, reconstruct multiplanar slices, performs volume and surface rendering with 2D or 3D texturing. The Insight Toolkit (ITK) is an open-source library for image registration and segmentation written in C++. Its foundation is the VNL (numerics) library for matrix algebra, which we also use in our own code. 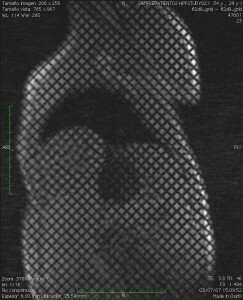 Papyrus toolkit and DICOM Offis (DCMTK) handle specific details of the DICOM image format used by the TMR sequences. Core-plot is a recent plotting library for MAC OSX and IOS. It allows for rich visualization of the torsion data. The Fastest Fourier Transform in the West (FFTW) is an implementation of the discrete Fourier transform (DFT) that adapts to the hardware in order to maximize performance. We implemented an in-house fully automated method for tissue deformation estimation in tagged magnetic resonance images (TMRI). We call this schema the Harmonic Phase Flow. The method consists of two main stages, namely Gabor Filter Bank computation and sequence filtering. We built two Gabor filter banks for each tag orientation. Both banks are fine-tuned for each left ventricle level. This allows for an optimally filtering of complex images. This is crutial, since the complex phase remains constant along the cardiac cycle. This brightness constancy condition is required by classical optical flow (OF) methods. Both filtered sequences belonging to a variational formulation schema are used in a to obtain a dense continuous deformation map. 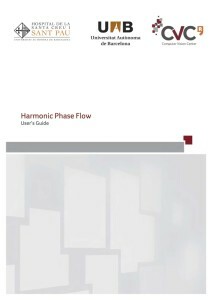 We consider this as Harmonic Phase Flow. This method has been used to determine reference values of ventricular torsion (VT) in a set of 40 healthy volunteers. The results encourage the use of ventricular torsion as a useful parameter for ventricular function assessment in clinical routine. Due to the complexity of the original implementation, we broke down the process into several tasks. HPF is a regularised spectral optical flow, under a variational framework that uses the maximum response of a set of Gabor filters banks. This flow characterises the ventricular torsion in healthy subjects. In step 1, we detect the harmonic peak which we use for building the Gabor filter banks (step 2). 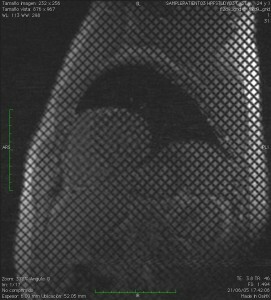 The combination of the response of banks produces a complex image whose phase is related to tissue motion (module 3). Finally, the we track the amplitude of the maximum response for building the displacement map. This tool is designed for clinical research only. Harmonic Phase Flow is not a medical device, and is not certiﬁed by any oﬃcial organism, including the Federal Drug Agency (FDA) or the European Medicines Agency . Licence: GNU public licence v3. Albert Andaluz, Francesc Carreras, Cristina Santa Marta, & Debora Gil. (2012). Myocardial torsion estimation with Tagged-MRI in the OsiriX platform. In Wiro Niessen(Erasmus MC) and Marc Modat(UCL) (Ed. ), ISBI Workshop on Open Source Medical Image Analysis software. IEEE.